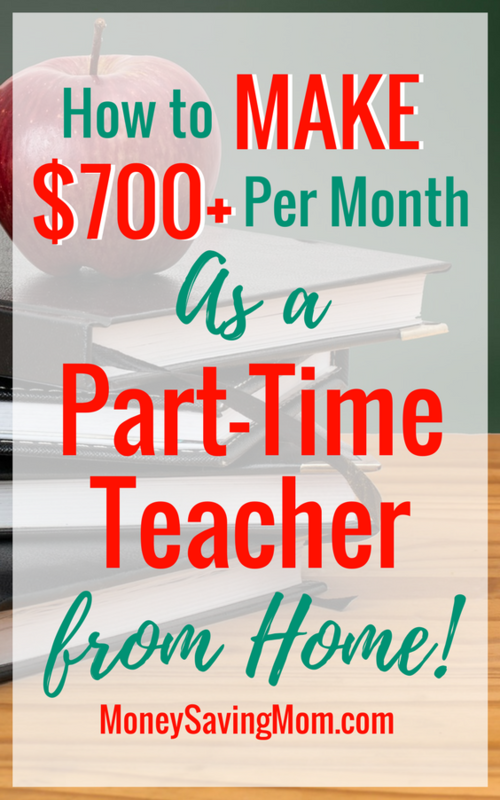 How I’m Making Over $700 Monthly as a Part-Time Teacher — Without Leaving My Home! Note from MSM: After we posted about this unique Work-At-Home opportunity last year, we had TONS of readers send in testimonies of their great experience teaching with VIPKid! 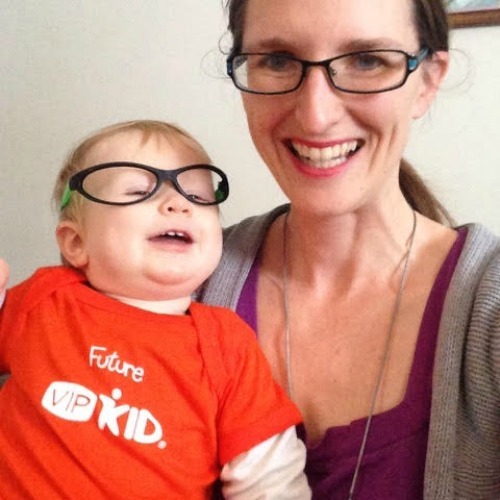 We thought it would be inspiring to hear a direct testimony from a reader who started as a new teacher with VIPKid and loved it. My husband, John, graduates from chiropractic school in April, but isn’t able to practice until he finishes all of his Board Exams and gets his license in August. As a homeschooling stay-at-home-mom of 3, I’ve done my best to bring in extra income whenever able to supplement the school loans. Throughout the 5 years that he’s been in schooling I’ve cleaned a car dealership and tutored at night, and I currently nanny a child 40 hours per week in my home. But, the loans will run out and we’ll need to several months of expenses until John can practice — which seems daunting at best and down right scary at worst. As John and I prayed and discussed our options, it seemed prudent for one or both of us to pick up extra part-time work in the months leading up to his graduation. Yet, for various reasons the thought of leaving home, pumping milk (as our youngest is 13 months and not yet weaned), and being spread even thinner filled me with dread. A few days after this conversation, I opened my inbox to read the daily update from MoneySavingMom.com. The very first article listed was about a Work-From-Home opportunity with the company VIPKid — an online ESL company in China that contracts Americans, with a Bachelor’s degree, to teach English online to Chinese students. At first, I was skeptical of VIPKid, but I’ve been a reader of MSM for the past 5 years and know Crystal would never recommend something to her readers unless she was positive about the quality. So, I jumped in and started the application the next day. 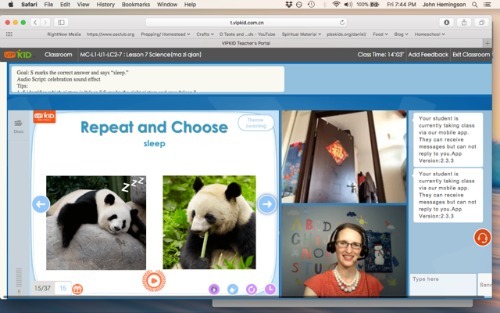 The interview process with VIPKid was intense and involved role playing to demonstrate your ability to teach English to a 4-10 year old Chinese student. But I was hired within 2 weeks of starting the interview process and had classes booked my first week of teaching! Another challenge as a VIPKid teacher was one of logistics. We live in a 2-bedroom townhouse with very few private spots to host a video-chat classroom. Some people teach in a closet, the basement, or just put up a sheet behind them. 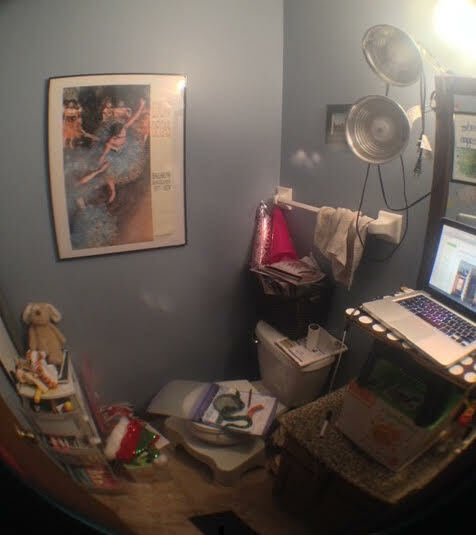 My solution was to turn our downstairs bathroom into a mini-classroom! I decorated the walls, set up bright lights, repurposed a rolling set of drawers to house my classroom props, and set up boxes on the vanity to make a “standing desk”. The location is far enough away from the bedrooms so I don’t disturb sleeping children, and everything is easily put away when classes are done! It has been a blessing to be able to stay at home and teach while the kids are sleeping. It feels good to know that by the time they wake up, I’ve already earned $40! VIPKid has been such a creative and unexpected answer to our prayers. Meagan is a homeschooling mom of 3 (ages 8, 5, 1). She has an Education degree and loves crafts. I have a couple of friends who do this and it is working out wonderfully for them! What a blessing! I needed this encouragement as I wait to get bookings. I was hired in December and everything is accurate, however I would add that it can sometimes take a few months to get regular bookings. in China right now is the time for Spring Festival/Chinese New Year so my bookings have been few and far between. I have been encouraged by other seasoned teachers to be patient. The company provides lots of training and encouragement and there are many online groups for support, plus many teachers with helpful YouTube videos. How much time does it take to prep for a lesson? I’ve done teaching before and specifically ESL and the lesson prep can vary widely depending on the situation. My husband does free lance work and the rule of thumb is that every hour you spend actually working and getting paid you spend almost another hour doing prep, networking, managing taxes, etc. Any thoughts on how much time you actually spend doing this? I have heard good things about this service. A sweet friend of mine has been doing it for months and LOVES it!! How are they about time off? I have a few weeks a year that I am completely unavailable. Do they let you work around your schedule, as long as it’s not excessive amounts of time off? Thanks for your reply, I’ll drop you an email this week. Yay!!! I love working for VIPKID!!! This has been my favorite job ever. I started in October, 2017 and this month alone I made $2000 (pre-tax). I am also a homeschool mom, and being able to make $60 before breakfast. 🙂 God has answered our prayers through this job. That’s great! I’m wondering if you live on the East coast to get such sweet hours or maybe you get up super super early 😉 It has been such a great, flexible job that leaves me free to care for my family the rest of the day 🙂 I’m glad it’s been an answer to prayer for you, too! That is so encouraging to hear! That is my goal once my husband starts his practice and is fully supporting us with his income. Then, I can start a giant VIPKid Debt Snowball 🙂 Keep up the great work. I’m sure we’ll have an “I’m Debt-Free” post on MSM from you in the future! By the way–I love your classroom setup!!!! That is ingenious! I thought it was SO creative!! Can you work just 5 hours a week? YES! You can work as much or as little as you want! I started teaching at VIPKID after reading an earlier post about it. Thank you so much! This job came at a much needed time for our family financially. I love that I can be done working by the time my kids wake-up, and I don’t have to pay for childcare! Hi … I’m just beginning my interview process. I’m a little nervous about appropriate props and how to ace the interview. Any tips? This sounds interesting. I taught middle school for 16 years but am not ready/willing to go back to the classroom full time.